There are battle royale games fought with realistic gunplay and building mechanocs, while others opt for a Hunger Games-style. 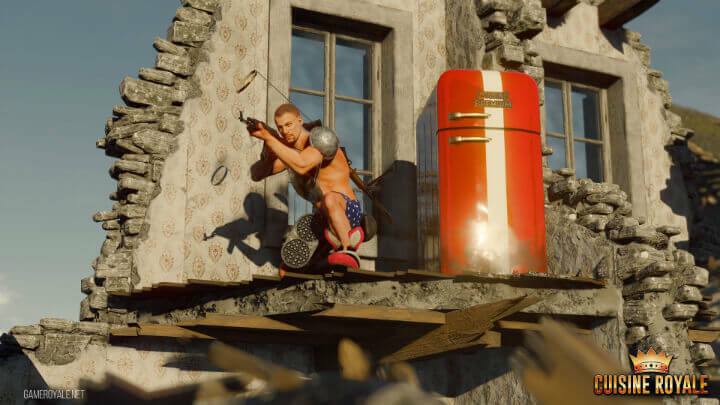 Darkflow Software and Gaijin Works worked on something unthinkable: a battle royale fought in underwear while using guns, food, and kitchen utensils as weapons and armor. Cuisine Royale is the result of probably the most awkward board meeting ever, and though it may sound like an idea that might immediately get thumbed down, it is actually thriving. After all, it’s one of the hottest new games on Steam. Though its origins are a literal joke, it is a game with a high ceiling and a potential to be epic. So, should you give it a shot and step into the kitchen utensil-filled battlegrounds? Let’s find out. The first thing you’ll notice about Cuisine Royale is its presentation. You can’t help but compare it to the likes of PUBG and H1Z1, just with much better graphics. It’s not even farfetched to say that it looks eerily similar to War Thunder, which is a Gaijin Works-published game. There’s even a map which looks like WW2 battlefield complete with a pillbox and a few machine guns. However, even if the textures and environments are far more attractive, the player movement and animations feel wonky and unnatural. Regardless, you’ll be able to move and aim smoothly without gamebreaking issues. Cuisine Royale is set like your typical battle royale game. You’re dropped into various random regions around the map (no battle bus or plane drops here!) and loot various places in the environment, like houses and bunkers for guns and loot. There are also loot boxes scattered in the open, and you can mine these for weapons. These range from kitchen knives, frying pans, and AK47s to WW2 themed weapons like the Gewehr rifle and the timeless 1911 Colt. Thre . As of today, there are only 30 players in the rather small map. To spice things up, there are usable mounted weapons scattered in the environment, like mounted 50-cal machine guns which can deal devastating damage. 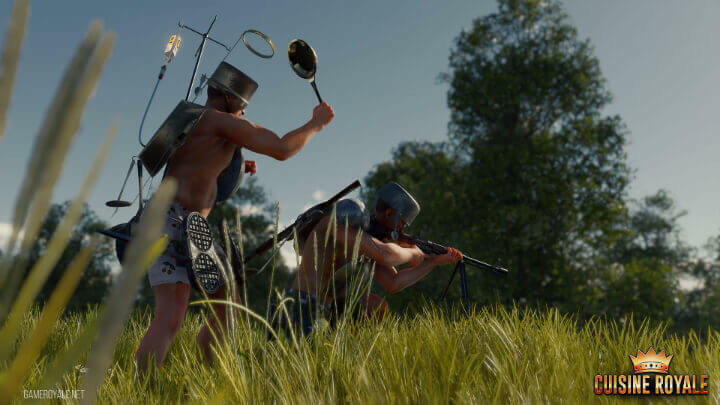 The food and armor system is what sets Cuisine Royale apart from most titles. You see, instead of real kevlar vests and helmets, you’re going to use pots and pans as protective gear. For example, a colander can be used as a helmet, while a frying pan acts as a shoulder protector, and a huge pot is a breastplate. Healing items are mostly food like pizzas and pork ribs, while items like a medical dropper can help regenerate your health. 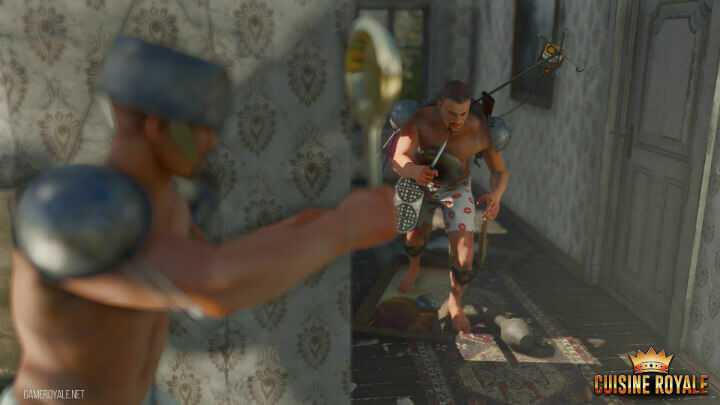 To add to the game’s wackiness, all players fight in their underwear. It’s hilarious seeing players strapping pots and pans to themselves while walking around forested terrain, acting like soldiers. Unfortunately, the game is still bareboned in terms of content. Squads and duos are still not part of the gameplay options. Nevertheless, the game receives constant updates, giving us players something to look forward to. In addition, it also has a massive potential for cosmetic microtransactions which can definitely make your character look as wacky as possible. Overall, Cuisine Royale is definitely a game you would want to invest time in. It’s new, it’s wacky, and it looks more polished than other battle royale games. It still has more coming for it in the future, so start strapping in frying pans and load up your weapons!